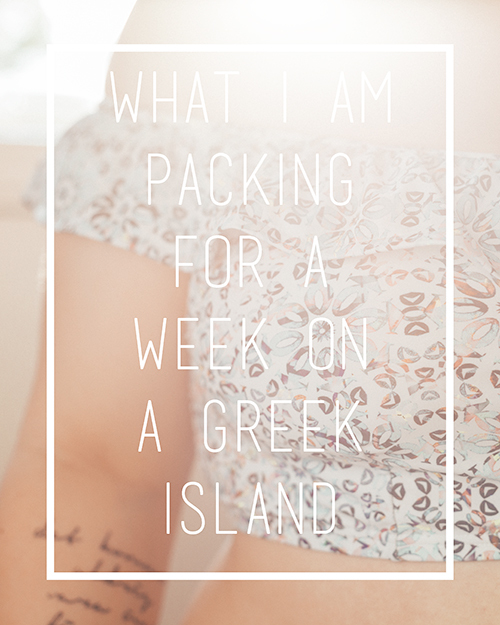 I did an Instagram-poll the other day (@strokeofadventure) and you seemed interested in knowing what I'm packing for my week on Kos, Greece. Can't believe it's almost time to go. But anyways let's get in to my suitcase. My suitcase is from Epic and my model is called Crate EX Wildblossom. I have the medium size and I really like it. It has a hard shell and fits everything I need. I haven't used it in a while though since I've only been on weekend trips the last year haha. It's nice to finally use it again. I couldn't get a picture of it for this post though since it's still at my relatives' house and I'm picking it up on Wednesday. The other piece of swimwear that I bought is this long sleeved swim suit from Boohoo. I rarely get a tan and I almost always burn in the sun so I thought that a long sleeved option would be nice to have when you're in the sun all day. Also I thought it looked awesome. It was very hard to show on camera since I forgot my tripod at my parents house 3 hours away from here. But check it out on the website for a better look! Other than these two new pieces I'm bringing my high waisted black bottoms from H&M (similar here) and a plain back bikini set also from H&M several years ago. I'm also bringing cyclops and a snorkel which can be found here and a pair of flippers that can be found here. Woho, my favourite part! I'm of course bringing way too much camera gear since that's just who I am haha. 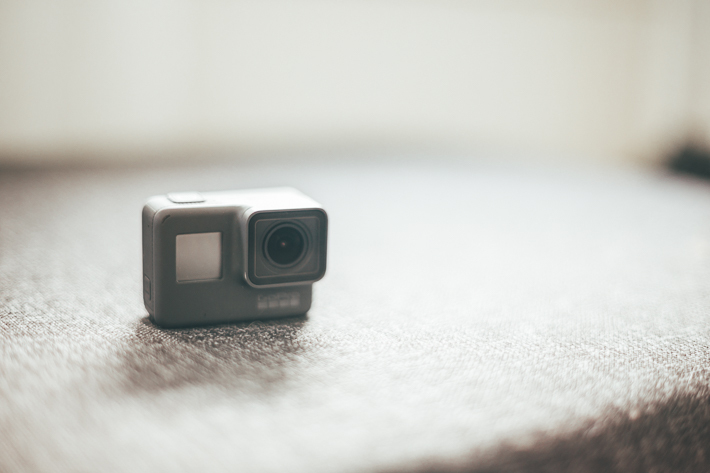 Besides my main camera, a Canon 6D, I'm bringing my GoPro Hero 5 Black that I haven't really had the chance to test out yet! I'm also bringing way too many accessories for the GoPro like a selfie stick, a floaty selfie stick, an arm strap etc. For my main camera I'm only bringing my 50mm f/1,4 since I'm too lazy to carry around my heavy wide angle lens haha. I'm also bringing my laptop and my external hard drive. This means clothing, skin care and other things that I really don't care about haha. For clothing I'm only bringing t-shirts, shorts and a beach dress haha. I don't really care about fashion that much and this is not a fashion blog. Skin care and make up I'm more interested in and this is what I'm bringing. 1. Foreo Luna Play Plus - This I what I use to clean my face together with number 2. Your face feels so clean after using it and you can literally see all the dirt on the Foreo after scrubbing your face with it so it must be good! 2. 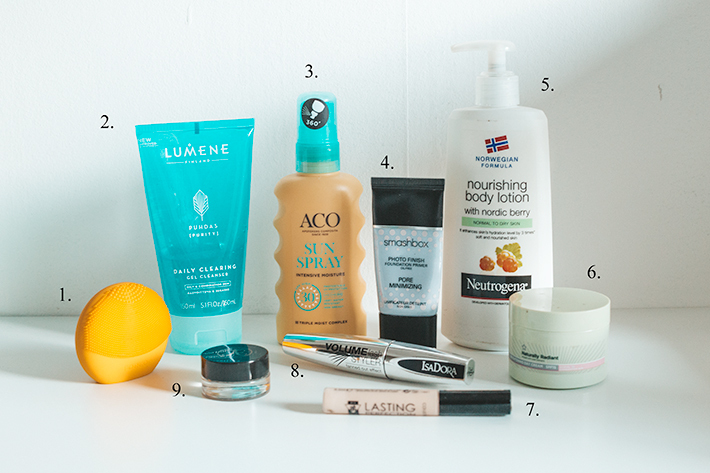 Lumene Daily Cleansing Gel Cleaner - As you can see I've almost used all of this. I love Lumene and have been using their products for several years. It removes all dirt and makeup in just one wash so I'm impressed. 3. ACO Sun Spray - Sun screen!!! So important and since I burn very easily this is a must for me. This one is SPF 30. 4. Smashbox Photo Finish Primer - I love to use this both with and without foundation. When I'm just going to work or school I put a tiny bit of this on my nose and chin and my pores are gone with the wind. When I use it with foundation it makes the skin look so smooth! 5. Neutrogena Nourishing Body Lotion - After being in the sun all day I like to moisturize and this is my all time favourite lotion. 6. Superdrug Naturally Radiant Cream - I ran out of face cream when I was in Edinburgh and I ran to Superdrug to buy the cheapest thing I could find. This was it. It's okay and it does what it supposed to do but it's nothing special. 7. Collection Lasting Perfection Concealer - I have been using this stuff for YEARS and I love it! It's SO cheap but still the best concealer I've ever used. I always buy several when I'm in the UK since you can't get them in Sweden haha. 8. Isadora Grand Volume Lash Styler - A mascara right up my alley. It seperates the lashes beautifully and gives lots of volume. I'm happy with it. 9. Anastasia Beverly Hills Dip Brow Pomade - Really like this. It's pricey but I've tried cheaper versions but never been satisfied with any of them. This is the best one I've tried so far! But that is everything I'm bringing. I have a lot of extra space in my suit case and that's usually the case when I'm travelling. I always travel super light but that's just the way I like it! And I never pack my camera gear in my check-in bag. I always bring it in my hand luggage since I don't want to loose it if my bag is lost. Svar: Vi borde resa tillsammans snart!! !